The medium-sized businesses are the ones that are experiencing a rapid growth in their business and they are the ones who can use cloud-based business managements for implementing a disciplined process without having any restrictions on the flexibility within the organization. The mid-sized organizations are shifting towards cloud technology so that they need not spend more money on hiring IT staff or building an IT infrastructure. This shift is something that the all rely upon as access to all the data becomes easy for all. An added advantage to this is that once the cloud technology is deployed the business management solutions can be found out rapidly, the system can be custom made according to the business needs which actually helps them to easily replace or change the system as and when needed. It so happens that a small business grows into a mid-sized enterprise or a mid-sized enterprise grows into a large one, it finds out that the business needs to be streamlined and they need to take control over the productivity and gain some more visibility into the various operations that need to be conducted. In the past it used to happen that these challenges were addressed by implementing a monolithic ERP system which was a long and expensive one. But now due to the cloud based solutions the enterprises grow and run a lean, agile business without having much costs, protected implementation cycles and the complex business process reengineering. A Deloitte report in the year 2014 commissioned by Google, found out that the small and the medium business that are using the cloud technology have overcome their growth challenges by 26% i.e. they are faster and have delivered 21% higher gross profits. Around 85% organizations believe that the cloud technology enables them to scale and grow their business at a fast pace. Whatever is the size or the specialty of any company they always face the pressure of growing the revenues, reduce the cost and increase the profits. The struggle with the legacy systems and the manual processes, lack of the business insights, business processes that are streamlined and the integration of the supply chain will actually allow accelerating growth while reducing their costs. 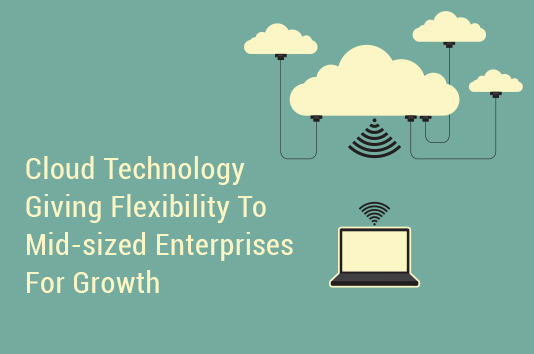 For more flexible solutions, we are seeing the rise of new era for a cloud-enabled business management solutions which are leaner, focused and agile than the past ERP systems. One of the main concern that any organization has is about losing visibility and control of their process. This can tamper the business and may have a problem in the future. You can have the flexibility of deploying the cloud technology on the infrastructure of your choice. If you are a mid-size enterprise and looking to deploy cloud technology, you can take Inspirria Cloudtech as your secured cloud provider partner with decade plus of experience working with 450+ Cloud projects. Push productivity to its optimum level with proven solutions, which is used by the best companies all over the world.